By hrynyshyn on February 21, 2012. Another day, another distraction from the real issue at hand. Yes, a hitherto respectable member of the climate science community, MacArthur fellow, and all-round good guy has admitted appropriating someone's identity to obtain private records of a climate-denial think tank. Was this wrong? Yes, although no more so than was the ostensible betrayal of trust on the part of a long list of whistleblowers. Daniel Ellsberg comes to mind. And he is now remembered as "an icon of truth-telling." And what about the fact the Heartland Institute impersonates a scientific organization every day? Does this matter have anything at all to do with the science of our changing climate? No. And I can't think of any else of use I can contribute to the discussion. Plenty of others have more thoughtful things to say. Greg Laden is a good place to start. Does faking amnesia permanently distort your memory? Gleick wasn't a whistle blower. He had no first hand knowledge of anything. What he did lacks integrity and shows his own hypocrisy. Kind of like him reviewing a book on Amazon that he never read. This will ruin him and it was all his own doing. He committed fraud. Who knows what he'll eventually admit to regarding the alleged fake document. This was dumb. Just dumb. And, he admits it was stupid. The "only" thing that Gleick's criminal activity has to do with the dangerous man-made climate change science is that it is the very same thing. All of the would-be research about the threats posed by the rising CO2 are based on similar crimes, fabrication of numbers and documents, and attempts to harm inconvenient people by fraudulent methods. Gleick may get his 10 years in prison for wire fraud which has been a federal crime in the U.S. since 1872 but the reality is that he and every other climate fearmonger deserves the electric chair. the reality is that he and every other climate fearmonger deserves the electric chair. Thank you for demonstrating that physics degree != intelligence, Dr. Motl. Oh! So much literary gymnastics and spin to try and cover up the crime, oh what a tangled web we weave when first we set out to deceive! The Warmists are a busted flush, and the only way to keep their lies and deceptions going is... more lies and deceptions. As if climategate wasn't enough in revealing the mendacity and thuggery of the AGW crowd we now have them caught red handed - Get out the popcorn and the deck chairs this is just the beginning! You appear to have brought out all the astroturf responders. Exposing Heartland is a public service. @2, @4: I'm sure you both posted similar messages of outrage when emails were stolen from climate scientists, and the messages misrepresented and lied about. would you remind folks of the level of outrage you showed then? Now we will see if the Heartland Instute does sue him, and for what. That will open themselves up to discovery and verification of what ever claims of "injury" are made. I suspect they will not sue anyone because that would simply shine more light on the dark and slimy underside they want to remain hidden. RE: "And what about the fact the Heartland Institute impersonates a scientific organization every day?" That is no brainier: The statement above is a smear. It is a psychological projection of purveyors of the junk science. But, everyone already has clear idea about the values of yours and your intellectual and moral integrity and your opinion is inconsequential. And I do not mean you personally, I mean all warmists like you who receive their idea from "The Universal" (the way Borg of Star Trek do) and do not make any effort to use their own brains and look at all sides of the debate. In your last post you quote fake memo's line about "dissuading teachers from teaching science." If you can take this line as real, if you can't see it is fake, you have intelligence of imbecile. Skeptics are not against science, they are against junk science and politicized science (which you purvey here on your blog.) The fact that you do not realize this testifies about low level of your intelligence. You do not have enough of it to contribute anything to the debate. But, of course you will still try. Next time you try to fake or purvey some "Protocols of the Elders of Climategate" try to use your brain first. Too bad you fell for the output of Heartless and their ilk. There are no 'sides' or 'debate'. What we do have is the peer reviewed science, and then there's corporately organised handwaving by their PR machine. Your 'Protocols phrase' being just such a freshly minted meme unheard of last week. but the reality is that he and every other climate fearmonger deserves the electric chair. Thank you, Dr. Motl, for again demonstrating that you're willing to put to death (or draw and quarter, or publicly flog) the messengers. The willingness to torture the messengers and put them to death reminds me of more than a few historical and not so long ago events that most people are ashamed of, even some of those living in an Authoritarian regime. Peter Gleick did something extraordinarily stupid. He shouldn't have done that. He says that himself. I'm sure he's willing to face the legal and other consequences or he wouldn't have confessed (as dean pointed out, I'm sure Dr. Motl and Gray also condemned the climate email hacker for his actions last year; and for the rerun this year). Now if only the climate hacker had the backbone to confess to his crimes. Skeptics are not against science, they are against junk science and politicized science (which you purvey here on your blog.) The fact that you do not realize this testifies about low level of your intelligence. Except no amount of evidence will ever persuade a "skeptic". Every scientific body in every developed country around the world acknowledges that climate is warming and that our emissions are responsible. The peer-reviewed literature has new articles every week dealing with some aspect of global warming. There's a mountain of overwhelming evidence for it and has been for a while now. And all "skeptics" can do is make threats, misrepresent, cherry-pick, quote-mine and fabricate while not even providing any cohesive alternate hypotheses (it's the sun, it's cosmic rays, it's natural, it's not warming at all, it's cooling, the temperature records show it is cooling, the temperature records show it is staying the same, the temperature records are corrupt and can't be used...except when they show cooling). The wannabe sceptic denialists are making death threats again. What else is "...but the reality is that he and every other climate fearmonger deserves the electric chair." meaning? Just imagine the denialist echo chamber if an "warmist" made such a stetement! If calling someone and pretending to be someone else would be a crime, every other telemarketer would be in jail. Ditto on most investigative journalists, PIs and a lot of other people trying to put their mark at ease by hiding their identity. I don't think Gleick's got much to worry in that respect. He might take some hits on the ethic part, as as much of the debate is already a "whom haven't we smeared today", I doubt it. "...good guy has admitted appropriating someone's identity to obtain private records of a climate-denial think tank." Hey, they used to do the same thing back when I was a teenager. They'd appropriate the identity of a theif to obtain the private stereo of a home owner. They used to call it stealing, but I guess they don't call it that anymore. Peter Gleick made a claim to be someone he wasn't in order to have the Heartland Institute provide him with incriminating information about their activities. The information so obtained was, in fact, incriminating so Gleick published it without editing. It has to date been shown that Gleick provided an accurate description of the activities of the Heartland Institute. Gleick therefore deserves to be punished. James O'Keefe made a claim to be someone he wasn't in order to have ACORN provide him with incriminating information about their activities. The information so obtained was not, in fact, incriminating so O'Keefe deceptively edited it to make it appear as if it was. It has to date been shown that O'Keefe provided an inaccurate description of the activities of ACORN. O'Keefe therefore deserves to be rewarded. It's all so simple: IOKIYAR! Really? Gleick didn't go into Heartland and take the papers, he gave a false identity and THEY GAVE HIM DOCUMENTS. So the HI sent their secret documents without checking if the address was correct? They seem to approach information security with the same careful diligence they use when analysing scientific results. Gleick should use the "Hey, it was a joke!" defence. With no dog in this fight, my opinion is that heartland took private money and funded researchers to do work on alternative theories to AGW. Nothing criminal there. If their science is poor, it will eventually suffer a Darwinian defeat, as good science always wins out in the long run. Or, more precisely, they took private money and chose to fund propaganda efforts rather than actual, publishable research. NJ you seem to be excusing a crime. I wonder why. Your expertise is not any better than Chris'. Well, someone else did it!!! I guess most lawyers were absent the day they taught that as a defense. "I'm sure you both posted similar messages of outrage when emails were stolen from climate scientists, and the messages misrepresented and lied about. would you remind folks of the level of outrage you showed then?" NJ you seem to be excusing a crime. Assuming facts not in evidence, son. Being told by deniers with a documented history of mendacity that a crime was committed is not sufficient. The current record indicates he was sent the files in question after having asked for them while using an alias. If I ask you to send me $1000.00 and you do so, you cannot charge me with theft if you haven't bothered to verify my identity. You can be charged with gullibility, however this is not currently a criminal behavior. Deniers are liars and their pants are on fire, or hanging in tatters around their ankles, more accurately. Dr Gleick has made an historic contribution to the effort to confront and expose those who seek to sow doubt about climate science, and done all those who care about truth a huge favour by having the courage to blow the whistle. He has nothing to apologise for. Crime? What a pathetic joke. Dr Gleick outsmarted Heartland and has exposed them for the charlatans they are. He was able to do this because someone leaked him documents providing him with details of those who had them, and a list of what to ask for, in order to confirm they were all real, and to be able to let the rest of u know about them. A true scholar and a courageous gentleman. I hope fakegate.org whips itself up into a froth that is blown away by the winds of truth and justice. Science blogs fighting on behalf of global warming alarmists will be remembered as well as Tycho Brahe fighting for geo-heliocentric astronomy, or Peter Guthrie Tait arguing for presenting Maxwell's equations using the calculus of quaternions instead of vector calculus. But I note scienceblogs left the task of defending global warming alarmists to a mere journalist, so it will be even less notable. Oh my, Gleick was on the board at the NSCE....that explains why a long suspected NSCE sock, Guettarda, is defending his wikipedia article from the use of the word "fraud"...this is hysterical. "What he did lacks integrity"
What about the lack of integrity Heartland Institute display every single day? But the justice system killing a mass murderer so they won't kill again isn't murder. Even though the state penalty is bad, it's less bad than the penalty of letting the original acts continue, hence it's allowed, with reservations. Ah, the dishonest creationist Willy Wally has shown up to opine! Given his record - best exemplified by his attempts to explain to PZ what had occurred at an event that PZ attended and Wallace had not - a provisional conclusion in favor of Gleick's account is not unreasonable. Given PZ's gaming of the Expelled RSVP system, and his unauthorized use of a teleconference code during an expelled press teleconference, and his reputation as Eugenie's mad dog, it's not surprising that he his mischaracterizing the CRU email leak as a hack job on his own blog, and it's not surprising he's sending his meat puppet here to muddy the waters with red herrings. Interesting, too, that the formally single issue national center for Darwinian education has branched out into climate alarmism. When I first started reading about Gleick's exploits, I immediately thought, "this sounds like something the NSCE would do.". Imagine my lack of surprise when I learned that he was resigned from the NSCE board. One might suspect he is taking the fall for Eugenie, but I don't. Eugenie has been around the block a few times, and Gleick was probably resigned not for ethics concerns but incompetence. Darn auto correct is replacing NCSE with incorrect NSCE. For definitions of 'gaming' that include 'requesting and receiving free tickets by following the movie producer's advertised Web-based procedure and doing so under his own name'. As is typical for creationists, Wallace prefers to make up his own definitions of words so as to cast reality in a false light. This is due to the fact that reality stubbornly refuses to worship his preferred interpretation of his preferred translation of his preferred set of religious writings. Nice subterfuge, NJ. PZ was unable to produce his invitation, and his fanboys claimed (and continue to claim) the RSVP site for invitees was the invitation. PZ wouldn't produce his invitation for comparison, and when challenged, got out a ban hammer. But I do have to hand it to you people. You are skilled at deflecting attention from one important question not even addressed on post: Who wrote the forged memo, and why did Gleick make his admission of impersonating another to gain confidential information after more and more people were suspecting it was he who wrote it. PZ was unable to produce his invitation, and his fanboys claimed (and continue to claim) the RSVP site for invitees was the invitation. As you well know, you weren't actually there, and the story you are sticking to is a complete fabrication. Hardly. It simply occurred to me that others might want to weight your comments appropriately given your inability to remain factual. Those with extra curiosity might investigate why you were given the heave-ho at Pandas Thumb, too. Assuming facts not in evidence, child. But I was invited. I just didn't RSVP. PZ was not invited, but he did RSVP, and feigned surprise when he wasn't allowed in. PZ's defense was that a lot of other people also were allowed in after using the RSVP system without invitation. It was a question. Let me rephrase it. Given the evidence others have provided that Gleick might have written the memo, and the subsequent admission by Gleick, who do you think wrote the memo? Again they dredge up Climategate! Hilton Gray (#4) takes the cake: "As if climategate wasn't enough in revealing the mendacity and thuggery of the AGW crowd we now have them caught red handed..."
Jeeze, you guys must have doctorate degrees in hyperbole and exaggeration. You act as if a single mistake by one man condemns the whole world! You might have noticed that most developed nations do not have a death penalty. Aye, but one that prides itself on being the free leader of the world does. It may be a barbarian country, but it's still one of the developed nations. And many people agreed with the murdering of Saddam Hussein and Osama Bin Laden. PZ was not invited, but he did RSVP, and feigned surprise when he wasn't allowed in. So, PZ did not get a proper invitation. But when he registered himself, he also registered his wife, his daughter and Richard Dawkins. At the same time. And they got in to the preview sans hitch. So either they were improperly registered but let in anyway, or PZ was properly registered and just refused admission as he stated. You see, William, we all know that you have to defend your a priori ideological commitment regardless. And if you have to misrepresent things once in a while, well, you feel it is because of a 'greater good'. But the rest of us just see your dishonesty and weight your opinions and comments accordingly. When I was young, there was a park pool that required membership, and some people would sneak in under a gate. A few of those would get caught, and asked to leave. Others did not get caught, and got to swim. How well did it work out with the parents of the children who got caught when the culprits defended their actions with "other kids did it too, some of whom I encouraged, and they didn't get asked to leave." I guess you've sneaked in to every cinema show you've ever seen. "Gleick didn't go into Heartland and take the papers, he gave a false identity and THEY GAVE HIM DOCUMENTS. The word "stealing" shouldn't even be on this page..."
Yea, I see what you're saying. That's like when a guys puts on a mask of Obama and then goes into a gas station and demands all their money, since the cashier GIVES HIM THE MONEY it's not considered robbery. I get it now. You're right 'stealing' shouldn't even be on this page. Sorry. "That's like when a guys puts on a mask of Obama and then goes into a gas station and demands all their money"
No mask. No demand for money. And Obama himself coming to a gas station and asking for the money wouldn't get the money unless the attendant wanted to give him the money. That's like when a guys puts on a mask of Obama and then goes into a gas station and demands all their money, since the cashier GIVES HIM THE MONEY it's not considered robbery. More like the guy puts on a mask of the gas station owner, goes in and asks "Could I have some of the money? ", making no threatening gestures whatsoever. The cashier then says "Sure thing, boss!" and hands it over. We understand that the people who tell you what to think are saying to you its a crime. It's just that the facts keep getting in the way of your demagoguery. Ah, William Wallace, you, too, have fallen foul of the Lord High Executioner, been tried, found guilty, and to be condemned to contempt (cue to yell, âFreedom!â)â¦ all from a poster who is unable to offer reasonable response to genuine questions that might raise doubt in their own beliefs, resorting to vitriol and invective with anyone who refuses to follow the religion of Mann-made Global Warming. My own understanding of the situation is that Gleik made up the condemnatory document, and posted it as from Heartland. Fraud in anyoneâs book, I would have thought. However, you are obviously more adept at this than I am, and have other allies. Just add me to their number, and I shall just sit back and enjoy. Really, please leave the necrophilia alone. Wow, I am sure that the likes of James and NJ really do NOT want someone like you on their side â you would shame even the most ardent of pseudoscientists, never mind genuine scientists. Apart from on your comment, where does the word âBrainsâ appear on this site? And how can the non-quote be linked to necrophilia (outside your own sad little mind, that is)? As usual, you show your mastery of creating your own quote, attributing it to whomsoever you want to ridicule, then extrapolating it to the most ludicrous of conclusions. Do the serious scientists a favour, and keep quiet. Or, for the less factually-challenged, Wallace was caught red-handed misrepresenting the facts of an event. Even if he disagreed with the discussion, there was no reason to offer such a blatantly false and easily disproved version of the events. Having done this, been caught, and then continuing to push the incorrect version is sufficient grounds to deprecate the factuality of any of his statements unless he can provide outside corroboration. I guess you missed that part in your need to have someone, anyone on your side in your assault on the windmill of, what was it you said..."the religion of Mann-made Global Warming". That you prefer incompetent allies is no surprise, given your preferences for incorrect understanding. Luke 4:23 comes to mind here. I am not familiar with the many scenarios that seem to link a few of you, and of which it appears William Wallace was referring to and about which you are possibly suggesting he is not being totally truthful. Having read his various comments on this and other sites, I am in agreement with his sentiment, though not necessarily with its execution; others do present themselves in a manner I find preferable â though not with LuboÅ¡ Motlâs idea of consigning âfearmongersâ to the electric chair (even if guilty, it is not yet a crime, let alone a capital one)! Like all other sciences, climate science has to be open to scepticism and debate (preferably constructive debate); to decry sceptics as heretics, traitors to âthe causeâ (a term openly used by the CRU team, which does make it seem more of a religious belief than scientific study) is plain stupid. One of the greatest scientists of all time accepted that it only took the existence of one fact to completely destroy his carefully constructed theories. I am not sure about the reference to âPhysician, heal thyselfâ¦â; surely there is a more apposite Biblical quote? Yes, I may be tilting at windmills â they have rapidly become a true blight on the landscape â perhaps I should just get out a deck chair and share the popcorn with Hilton Gray. "then extrapolating it to the most ludicrous of conclusions." You, however, do not bother with even misquoting, and don't bother even engaging your eyeballs to read a statement, preferring to run both sides of the conversation in your own little brain. By the way, you ARE the ludicrous conclusion. "I am not sure about the reference to âPhysician, heal thyselfâ¦â;"
A case in point. YOU are a loon. "surely there is a more apposite Biblical quote?" Before whining about a perception of a splinter in someone's eye, look to the entire coppice in your own. "Wow, I am sure that the likes of James and NJ really do NOT want someone like you on their side"
However, since the denialists have only loons on their side, you're entirely welcome over there, hence (as long as you toe the party line there), you're given all the accolades your pride desires. "Like all other sciences, climate science has to be open to scepticism and debate"
HOWEVER, you lunatics don't listen. As merely one example of how what you and your cohorts are doing is NOT debate. What you MEAN is that science must be open to filibustering for political and religious reasons. "to decry sceptics as heretics"
Nope, only WTFUWT does that. Look at how the deniers treated Roy Spencer when he attempted to tell them that, yes, the Greenhouse Effect was real. "traitors to âthe causeâ (a term openly used by the CRU team"
YOU are "the cause" of much CO2 production. This has NOTHING to do with religion. However, to enable YOUR religion to be treated rationally, you have to pretend that everything else is merely a rebadged religion. "One of the greatest scientists of all time accepted that it only took the existence of one fact to completely destroy his carefully constructed theories." Then show one fact to destroy the carefully constructed theory. Nobody managed to do that with the theories of that "one of the greatest scientists of all time". Wow, you really do not get the point, do you? Are you being deliberately obtuse, or are you genuinely thick? One reason I mentioned the quote from the well-known and respected scientist (have you worked out who it is yet?) is that he accepted it only took one fact to disprove him; I am sure he would have relished it had it occurred in his lifetime. However, you and your ilk will not accept that there can be ANY fact to disprove you – you claim that the world is warming, which, according to the carefully constructed theory and resultant climate modelling, means the icecaps will melt, hurricanes will worsen, and drought will spread; yet more snow falls than normal, the icecaps thicken (as well as Himalayan glaciers), summer is colder, hurricanes quieten, and floods spread; you then claim that is because the world is warming! You categorically refuse to accept that the weather over the past few years, despite being so far outside the predictions of the much-vaunted climate models, shows that there are flaws in your argument. Such trenchant denial of evidence is the doctrine of a religion. One maxim in science is that a theory has to be falsifiable; give me one fact, just one fact, which if it exists or occurs, could prove you wrong. I know I am living on false hope there; you will, as usual, merely let loose you vitriol upon me. You claim the “denialists” refuse debate, yet will not deign to engage in it yourself, just use insults in the hope of intimidating me to submission. I do not doubt that there is climate change; climate, like all else in the universe, will be subject to variability, and will have its ups and downs, whims to whit we know nothing. What I do doubt is that this climate change is caused by a slight variation in a scarce gas in the atmosphere; however, even if it were so, why is it only that part of the gas that has been generated by humans that is at fault? Why has carbon become the bête noir of the world? Surely, all life forms we know of (but one – and that was in Star Trek, so is fictional) are carbon-based? One other thing that I doubt is that we can have any influence whatsoever on the climate change; it is part of a natural cycle of which we have little, if any, understanding. To entrench yourself behind the ramparts of AGW – denying that there can be any more room for debate on the matter, the “consensus” must be right (as was the consensus on a flat earth, or the phlogiston element of fire, or on Biblical creation, or eugenics, or on Piltdown man… the list could go on and on. Bertrand Russell (you might have heard of him; but then…) knew about consensus: “The fact that an opinion has been widely held is no evidence whatever that it is not utterly absurd; indeed in view of the silliness of the majority of mankind, a widespread belief is more likely to be foolish than sensible.”) – will do absolutely nothing to increase our understanding of the forces at work. I have heard that the ice-caps on Mars are receding – can the effects of man-made Earthly CO2 reach so far? It is certainly portrayed as being malevolent enough to try it. Or could it be possible that there is another source of heat that might be prone to variability, of which we have absolutely no control? "climate, like all else in the universe, will be subject to variability"
Except, and you seem willing to ignore this as a matter of faith, that all variations are the cause of a variation in the forces involved. So what forces of climate are varying now and in what way do they change the climate? Well, according to people who actually study the physics, we're generally cooling from all the natural forcings and human effects are causing warming at a higher level than these cooling effects. "I have heard that the ice-caps on Mars are receding – can the effects of man-made Earthly CO2 reach so far?" No. However, when it's a Martian Summer, ice caps ON MARS will shrink. I've heard that only idiots fall for that bogus claim. Does this mean you think everyone else is an idiot, or that you are an idiot and though it was valid? PS why you proclaim ignorance of the climate, please do so for yourself only, not palm your ignorance on to everyone else. The climate is understood well enough to be able to recreate the climate from before mankind existed from just havintg the forces involved supplied, and forecasts in 1981 for the climate up to 2000 were almost spot on. YOU don't understand climate. However, you don't understand nerve physiology. That's why we go to a surgeon when we want medical prodedures carried out, not to you. Thank you, Wow, for such a reasoned, pleasant reply; so much better than the diatribes you have seemed to be fond of in the past. Not too sure what you mean by: “…all variations are the cause of a variation in the forces involved.” Variations occur; the reasons for the variations may be known; they be conjectured; there may be no obvious cause; there may be an evident cause – however, that does not mean that it IS the cause. So, the reasons for variations are as variable as the variations themselves; this, I presume, is what makes science such fun for a lot of people – others, of course, may prefer the perceived immutability that many branches of science have to offer. As for the shrinking Martian ice-caps, your point is noted; however, I do not know the axial tilt of Mars, but presume that if it is summer in one hemisphere, then it will be winter in the other (though I admit I am limited to only one model to base that presumption upon); thus, if BOTH ice-caps are shrinking, then your argument gets a bit shaky. It could be that the axis of Mars in close to perpendicular to its orbital plane; if that is so, then it is possible that the difference in the proximity of Mars to the Sun at its perihelion and its aphelion could cause “seasons”. Also, I have not verified the claim of the shrinkage, but merely noted it as an aside. Finally, why do you assume that I do not understand nerve physiology? Is it not possible that even a medical doctor can be woefully ignorant in other fields? "“…all variations are the cause of a variation in the forces involved.” Variations occur; the reasons for the variations may be known"
And humans have increased CO2 levels 40%. There's a variation. And a similar variation in the past caused large climate changes from glacial to interglacial. "then it will be winter in the other (though I admit I am limited to only one model to base that presumption upon); thus, if BOTH ice-caps are shrinking,"
On this planet, the variation in the extent of the southern polar ice cap is much lower than the northern ice cap. Therefore total ice cover decreases more in the NH summer than the SH summer. The Southern Hemisphere summer occurs when we are near perihelion and the NH summer when at aphelion, therefore the average global temperature in NH summer is lower than in SH summer. That, by the way, is why we are in a Milankovich cycle that should be taking us toward an ice age over the next 10,000 years. Like I said before, just because YOU are clueless doesn't mean that ignorance extends to everyone. "Is it not possible that even a medical doctor can be woefully ignorant in other fields?" You seem woefully ignorant of every field you have assayed an opinion. Why should we expect any competence from you in any other spehere of endeavour? “And humans have increased CO2 levels 40%. […] “…similar variation in the past caused large climate changes...” Actually, that is one of the main points of contention – some scientists say the link is not quite as clear-cut as claimed. And I still have difficulty accepting that such a change in what is a very small proportion of the atmosphere of a gas upon which all plant life depends can have such huge effects; nothing you have told me has convinced me. The analysis of oxygen isotopes in the Law Dome does suggest that your rigidly-held beliefs might not be the case. Also, what other changes have occurred that may have some influence? Actually, it is you who fails again, kid (alas, you are slowly sliding into your usual offensive ridicule): when it is winter in the Southern hemisphere of Earth, the ice-cap will be more extensive than in the summer. Okay, the range is not as great as it is in the Northern hemisphere, but there is a decrease in summer. There is not a decrease in both poles at the same time. However, it appears that both poles of Mars are experiencing reducing ice-caps at the same time. I gave one reason how this could be the case; I also mooted one cause that could have an effect upon this planet, too; I do accept that both of these could be wrong, but would like to engage in more constructive debate. As we have never raised the points of nerve physiology, or any other topics outside the rather small range of the climate debate (about which I do admit a deep ignorance), you are demonstrating that your own scientific credibility has to be open to question by you leaping to quite astounding conclusions about me. "Actually, that is one of the main points of contention – some scientists say the link is not quite as clear-cut as claimed"
And some scientists say that the earth is 6000 years old. They are, however, the extreme lunatic fringe. Like your fellows. "And I still have difficulty accepting that such a change in what is a very small proportion of the atmosphere of a gas"
Again, just because YOU are clueless doesn't mean anyone else is. "a gas upon which all plant life depends"
Isn't that a rather huge effect? Didn't you just say it CANNOT have a huge effect because it's so miniscule? As to its proportion, the IR active atmosphere is less than 1%. And since the majority of that 1% is H2O which increases with temperature increases (hence a feedback mechanism), the second most common gas is CO2. I guess you're still pretending your incapability has some meaning in the world. When you've been so wrong about so many things on climate, why do you insist that your uninformed and error-prone opinion has any value whatsoever? In short, when are you going to stop being a believer and start being a skeptic? “When you’ve been so wrong about so many things on climate, why do you insist that your uninformed and error-prone opinion has any value whatsoever? Actually, these are the sort of questions I could be asking you… however, I am not quite as spiteful as you. It is odd how any – ANY – scientist who questions your rabidly-held beliefs is nothing but a crank and weirdo, someone not fit to exist in this world. As the climate has quite happily continued in complete defiance of all the dire predictions of your pet “scientists” (the ice over Antarctica is thickening, as are the glaciers of the Himalayas, even the Arctic sea ice is, erm, actually normal; last year was the quietest ever for hurricanes; the world is experiencing some of the wettest droughts on record; etc, etc), how can you have the nerve to berate me for my doubts? As I have asked before, is there one fact that could exist or occur that could prove CAGW wrong? If so, what would that be? Is there ANY evidence you would accept that would make you accept AGW is correct? A long shot, since this information has been available and solid for 30 years and you STILL whine about how you "can't believe" CO2 is super effective. Tell me, if something even less present than CO2 in the atmosphere can have a dramatic effect, would you drop that "I can't believe such a trace amount can affect the climate"? Or will that remain one of your tenets of faith? “Is there ANY evidence you would accept that would make you accept AGW is correct? If there was SOMETHING that indicated that this could be the case, I would accept it; as yet, all the evidence is that the theory is seriously flawed. I have given a few examples to back my case (which is considerably more than you have offered me at all) – have you bothered looking at them? Nope. As stated on another thread, I will stop beating my head against the wall; it is an activity that might meet the approval of “the consensus”, but it feels so-o-o-o good when stopped. "as yet, all the evidence is that the theory is seriously flawed"
So you don't believe the evidence of the temperature record? "I have given a few examples to back my case"
Remember: the case is to show the climate isn't warming. You have not done this. Maybe you need to look at evidence, rather than hide your head up your ... sand. "the ice over Antarctica is thickening"
"it appears that both poles of Mars are experiencing reducing ice-caps at the same time"
Which happens here on earth too because neither planet is in a circular orbit. The globe itself gets further away from the sun, therefore gets cooler. Another patently false "example". "I still have difficulty accepting that such a change in what is a very small proportion of the atmosphere of a gas upon which all plant life depends can have such huge effects"
This isn't evidence of anything other than your incapability. Is no evidence of anything other than the climate science is hard. the desiccation of the atmosphere owing to the regional cooling. It has nothing to do with global warming. Prof. Phil Jones – of the UEA’s CRU – concedes that there has been no ‘statistically significant warming’ since 1995. The evidence for man-made global warming is looking shakier by the day, Prof Fritz Vahrenholt (Germany’s answer to Jonathon Porritt or George Monbiot) has admitted. A far more likely a culprit is the sun. Which is my contention all along. I have not denied there is a change in the climate; what I do dispute is that it is solely caused by human production of CO2 – that might be one factor amongst many others, but the global climate is too vast for us to make such ridiculous assumptions on the basis of one, very limited study. Mind you, I have little doubt that, in your rather limited synapses, the unseasonably warm fortnight the UK had in March was “proof” of global warming; however, the unseasonably cool two months we’ve had since is just “weather”. "Prof. Phil Jones – of the UEA’s CRU – concedes that there has been no ‘statistically significant warming’ since 1995." Additionally, this would merely mean it's possible to a very small amount over 5% chance that the trend is merely an artifact of an unrepresentative period (see above for the "12 years is not climate". Additionally, this means it HAS warmed to the best guess. But, like I said, this is not the case. However you are intellectually incapable of overcoming your inherent ideological bias and coming to any form of understanding. This is why you are called a denier. What assertions are you stating are absurd and what, in your mind, is the true alternative to them? Or is it that you’re going to make an absurd assertion so you can avoid answering questions that can’t be answered truthfully? Yes. And therefore AGW stands. The question now returns to you: do YOU understand that? That’s not the claim of climate scientists. It looks like another absurd assertion. And, like George Monbiot (Britain’s answer to Fritz Vahrenholt), he can be wrong. In this case he is wrong. Which isn’t climate. Which means that it HAS warmed up since the millennium. Which is in the face of an extended cooling period and an ocean phase that normally COOLS the global temperature. So, if it should be cooling, yet is warming, what does that say about AGW? I’ll answer since you are incapable: it shows that AGW is a real problem. “However, the professor admitted in a telephone interview with msnbc.com that he now thinks he had been “extrapolating too far.”"
You know that when you swear to tell the truth, you swear to tell the truth, the whole truth and nothing but the truth? Your lies by omission are lies. “Jim Lovelock has no university, no research institute, no students. His almost unparalleled influence in environmental science is based instead on a particular way of seeing things,” Oliver Morton, of the journal Nature wrote in Time. Go ahead and dispute that. However, since AGW doesn’t say this, this only proves your strawman is wrong, not AGW. That’s your claim. … and that of CNN; and Time; and Nature… oh, and National Geographic. Of course, these are mere two-bit journals, spouting utter rubbish. But hold! Real Climate is also in the fray! Could it be that my lies are having an unhealthy influence on such august institutes? You are in danger of disappearing up your own orifices. Surely the “temperature of the world” depends upon climate? While not truly synonymous phrases, people using “global warming”, “climate change” and “warming world” do seem to mean the same thing. Please try to come back with a reasonably rational argument to support your case. I have asked this before: what would you suggest would be suitable actions to take to counter AGW, and what, if any, actions are you taking yourself? Which happens here on earth too …” [sic] Unlikely, unless you are talking in the short term – say, perhaps for a few days during the equinox – but from solstice to solstice, one of the ice-caps will grow, while the other will shrink. “Your lies by omission are lies.” Not sure what you mean, here. Perhaps you are a total Bliarite, supporting the replacement of “Habeas corpus” (the principle of innocent until proven guilty) with “Corpus juris” (guilty until proven innocent). If I have made an untrue statement, it is because I am ignorant of the truth, not because I am wilfully hiding the truth. As for me pointing out the generally accepted observance of theories: climate models have been created, in an attempt to make predictions as to the likely outcomes of present climate trends. However, none of these predictions has, so far, been close to reality – surely, this has to be a good indicator of how sound the theory is. Also, the existence of a theory does not preclude the existence of another, perhaps contrary, theory. Each should be subject to intellectual assault; to dismiss someone who wishes to challenge the theory as a “denier” smacks more of religious fervour than scientific thought. Give me one fact that, should it exist or occurs, would prove your present beliefs wrong. Such an open-minded concept is, of course, probably anathema to your ideology. "and that of CNN; and Time; and Nature"
Link? Or should we just take the word of a known liar? "Surely the “temperature of the world” depends upon climate?" But the climate is 30 years average. Not 12 years. Not 8 years. Not 2 years. Not 1 year. Crack open a book on basic statistics. Learn. If at all possible. "I have asked this before: what would you suggest would be suitable actions to take to counter AGW"
And I have answered. Reduce GHG emissions (I have done so). Now, what do you suggest would be suitable actions to take to counter AGW and what (if any) actions have you done to that aim? I don't have to. They already know. Just because you're clueless doesn't mean anyone else has to be just as clueless. "Unlikely, unless you are talking in the short term"
YOU were talking about the short term. "but from solstice to solstice, one of the ice-caps will grow, while the other will shrink"
And this blindingly obvious means what? ” Not sure what you mean, here. " I mean that lying by omission is still lying. "climate models have been created, in an attempt to make predictions as to the likely outcomes of present climate trends"
Wrong. 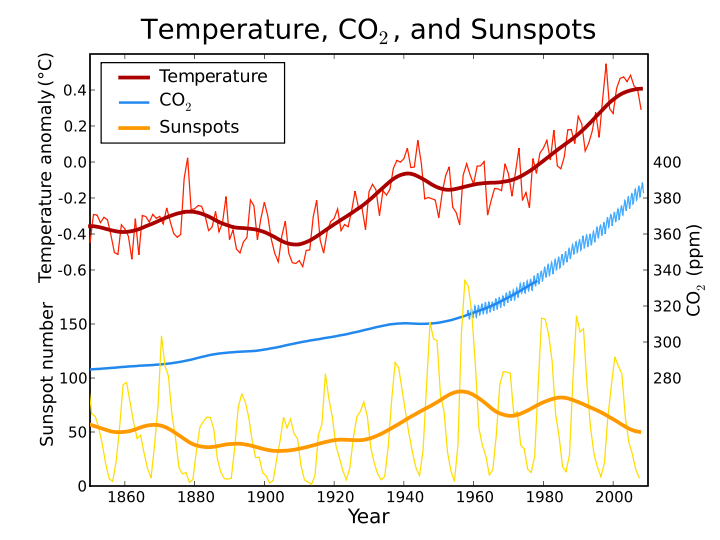 Climate models have been created to predict likely climate change in the future. "However, none of these predictions has, so far, been close to reality"
Hansen's 1988 model has been pretty much on the money. It got a sensitivity of 3.4C per CO2 doubling and what would have made an exact match with the record would have been achieved with 3.2C per doubling of CO2. Just because you believe liars doesn't mean what you believe is the truth. "“The growth of knowledge depends entirely on disagreement” — Karl Popper"
Now, how has that increased knowledge? "Give me one fact that, should it exist or occurs, would prove your present beliefs wrong." A climatological temperature trend that falsifies the climate models would do it. Just as it would falsify any scientific theory. If the predictions and observations do not match within the limits of expected error, then the prediction is accepted as false as given. When that happens, let me know. "Although it's tempting to blame the ice loss on global warming, researchers think deforestation of the mountain's foothills is the more likely culprit. Without the forests' humidity, previously moisture-laden winds blew dry. No longer replenished with water, the ice is evaporating in the strong equatorial sunshine." "In short, the answer to the question "Is it global warming or changes in weather patterns?" may be, simply, yes." I could find no evidence of what CNN said about it. However, we have two out of the three claims you made proven false. Again, you are a proving yourself a congenital liar. “… should we just take the word of a known liar?” That is a very slanderous statement; you ought to be more careful about your language in trying to debase others. Were I of a more litigious nature, I could take you to the cleaners. Why 30 years? Why not 25, or 50, or even 100? 30 seems to be, in itself, an arbitrary figure; on what basis was it chosen? Anyway, I grow weary of your petty diatribes. If we do end up together on a high hill, with the sea lapping at our feet, I will let you dance around me, chanting, “Told you so! Told you so!” Until then, farewell. "That is a very slanderous statement"
Nope, if it's written, that would be libel not slander. And, since it's true (and demonstrated as such), it doesn't count as libel either. Rather revealing how willing you are to silence voices speaking the truth. "30 seems to be, in itself, an arbitrary figure; on what basis was it chosen?" WMO based on the ability of statistical test to detect a genuine mean in the face of the inter-annual differences that are the distinction of weather from climate. Statistics 101, kid. Statistics 101. "I don’t think that there is AGW;"
Never asked you that. Can you not answer the question? Rather rhetorical, I know, since you refuse to answer any question that hurts your theology. "The climate change we are discussing is part of the natural process of the planet"
Burning fossil fuels naturally increases CO2. Increasing CO2 naturally leads to global warming. The only unnatural thing going on here (apart from your ignorance) is the burning fossil fuels. "Anyway, I grow weary of your petty diatribes. If we do end up together on a high hill, with the sea lapping at our feet, I will let you dance around me, chanting, “Told you so! Told you so!” Until then, farewell." I have to point out my admiration for your kind-heartedness for persons who actually need help on that content. Your very own commitment to getting the message up and down had been certainly powerful and has regularly empowered regular people much like me to arrive at their pursuits. Your warm and friendly hints and tips signifies a whole lot to me and a whole lot more to my office colleagues. Best wishes; from each one of us. What on earth is that supposed to mean??? Climate is the expected weather. Since we still HAVE weather, climate will continue to exist too. You really have nothing other than projection and faith to work with here, don’t you. It shows. Hmmm. Antarctica. Southern Hemisphere, right? It’s their winter, right? Though you already displayed your ignorance of spherical geometry with your clueless raving about Mars’ climate. Really? According to people who measure it: wrong. And some of the dryest wet periods on record. Really with all this straw, no wonder the cows are starving. Hello there, I found your site by way of Google whilst looking for a similar topic, your site got here up, it looks great. I've bookmarked it in my google bookmarks. Why did Dr. Gleick do what he did? If the "science" is "overwhelming," if everyone who counts already agrees with the alarmists, if there is no merit whatever to any opposing points of view, then why engage in petty info-warfare with the allegedly unscientific and nefarious Heartland Institute? After all, who is listening to them anyway? They haven't got any facts on their side. They have nothing to add to the discussion. The debate is over. The time to act is now. And your dear, dumb Dr. Gleick is engaging in tactics that resemble nothing so much as a lying propagandist trying to win the war for minds. And he sees the Heartland Institute as a threat. How could they be a threat? The science is so overwhelming! Everyone I know already agrees with Dr. Gleick. This panicky thievery is really gratuitous, and unbecoming of anyone so sure of his facts! I have a question for all denialist idiots. Why do you think it's based on belief? Because you're driven by your beliefs and nothing else, therefore assume that everyone else is and it's not just you that's mentally retarded? Thank you for resorting to name calling. It tells this "idiot" all he needs to know. I suppose I should apologize for calling Dr. Gleick "dumb," but I was referring to his actions being dumb, and I wasn't insulting his intelligence. To answer your question, I think I is based on belief because the facts don't seem to add up on their own. Every layperson has to decide what to believe on the basis of what scientists say. I have listened to both sides, and I remain skeptical of the alarmists claims, as do many other good people. I also notice you don't attempt to answer my question. Why did he do what he did? Uh, I was just following your lead, Andrew. Or is it only name-calling when someone who looks at reality for what it is says it and not when an idiot like you does it? His actions were not dumb. They may possibly have been dumb if your "theories" about what it achieved were correct, but they aren't. "I think I is based on belief because the facts don’t seem to add up on their own ... I have listened to both sides "
You most definitely have not, if your opening statement there is what you really think (and you don't think that, you're in cognitive dissonance over it and refusing to look because it would change who you think you are and what you think the world should do). "It's the sun doing it!" vs "It's not warming". Both denier memes for how AGW is false. Yet incompatible with each other. Yet you think the facts seem to add up for the denier side??? You can't even explain what "facts don't seem to add up on their own", merely assert it does to make your denialism *seem* rational as opposed to the irrational psychosis it is. "I also notice you don’t attempt to answer my question"
Because your question begs the question: is your assertion of what it achieved correct? Given that your predicate for asking the question is based on an incorrect assertion, there's nothing there to answer.
" the allegedly unscientific and nefarious Heartland Institute?" that you're in denial of what was found doesn't make HIM dumb for having INVESTIGATED the HI. Just you. Never mind, don't. I can see there's no point arguing with you, anyway, as I will soon grow tired of your personal insults, which seem to be your main argumentative strategy. It might make you feel smarter, but it doesn't make you so. Take care! P.S. I have read into what was "uncovered" and it looks like nothing more than a lousy idea for an ad campaign, though not an inaccurate one. Yup, and that lousy idea for an ad campaign was funded privately and those private funders are moving elsewhere because they don't want people to know what they're spending their money to do. It also uncovered several illegal operations, since HI's work is SUPPOSED to operate within its charter. They didn't. But you're going to see what you want to be there, aren't you? However, just because YOU hate the environmental movement doesn't make the INVESTIGATION Gleick made a waste of time. Just a waste of time trying to educate you. I have read into what was “uncovered"
Seems the evidence you demanded was easy to find. At least you actually looked. Most deniers don't bother: the demand for evidence is merely an attempt to punish others for not buying the conspiracy. If Heartland didn't operate withing their charter, then they deserve censure. I will wait until the jury is in to join you in condemning them, however. I don't happen to think that fighting for the minds of children not to be propagandized is such a bad thing. I support what Heartland does in general, but no institution or individual is above the law. Yes, I know petroleum companies give them money. So what. There is lots of industry money flowing to everyone on all sides of this debate, as I am sure you know. I am not sure what's so nefarious about creating a bad ad campaign, however. It is certainly no worse than the "No Pressure" video that showed teachers and employers blowing up people who don't agree to reduce their energy consumption. Was that a good ad campaign? I don't think so--seemed rather vicious. No wonder people are starting to wonder about the CAGW theory. The proponents of it exhibit more over-heated zealotry than I've seen in America for years. However, I am not a denier. Never call me that. It implies Holocaust denier, which is the ugliest and most mean-spirited thing you could call someone. I don't deny that climate changes. I don't deny that human CO2 emissions contribute to warming. I am about as well informed as any non-scientist can be on the subject. And yes, I am still not convinced that we need to turn our world and our economy upside down. I am open to being convinced anyone who can cite the study that shows conclusively the presence of strong positive feedback (other than from the notoriously inaccurate models, please) in the climate system that will force temperature up dangerously in response to the admittedly unprecedented CO2 levels. If I were convinced of THAT, this entire exchange between us would never have occurred. And if Peter Gleick's investigations has shown this, he deserves plaudits not condemnation. And what about Peter Gleick's show? Fantastic post, I concur totally and appreciate the time you took to create it, nice!